Who doesn’t want a bright, vibrant iPhone screen? Alas, the brightest screens exact a trade-off: Before you drag the brightness slider to the max, remember that brighter screens sap the life from your battery more quickly. You’ll find the brightness slider under the Display & Brightness setting. Sliding this control adjusts screen brightness. Tap the Auto-Brightness switch so that it’s on. This control adjusts the screen according to the lighting conditions around the iPhone while being considerate of your battery. You can find a similar brightness slider in Control Center, but you’ll have to visit Settings to turn the Auto-Brightness switch on or off. If the app you’re spending time in supports dynamic type, you can adjust your type size by dragging a slider. Under Display & Brightness, you’ll also find a slider for making text bold. Back when you set up an iPhone 6 or later, you had the option to change the Display Zoom setting from a standard (normal-sized icon) view to a zoomed (larger icon) view that claims more on-screen real estate. If you’re not satisfied with your first choice, you can change it here. You’ll have to reboot the phone whenever you make such a change. As part of iOS 10, Apple added the Night Shift feature found here in Settings. When enabled, the phone automatically alters the colors on your iPhone screen after dark so that they’re at the warmer end of the color spectrum. The promise is a night of better sleep. You can drag a slider that lets you change the color temperature to a warmer setting — give it a try to see which effect warms you up or, perhaps more to the point since we’re talking sleep here, cools you down. You can manually turn on Night Shift so that it is enabled until the next day. Or you can schedule the hours when you want Night Shift to automatically kick in and then cease. 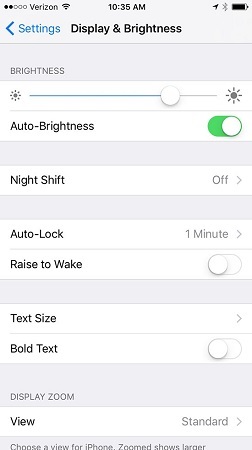 Settings for the Raise to Wake feature are also found under the Display & Brightness setting. As with Night Shift, the feature arrived with iOS 10.